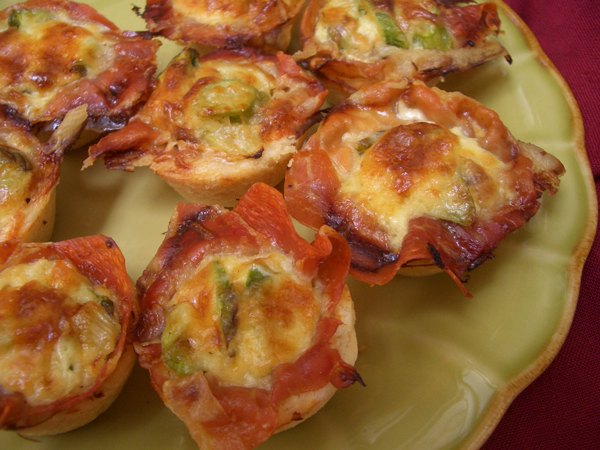 We’re finally feeling the fall chill in San Francisco and that always makes me think of certain foods and quiche is one of them. 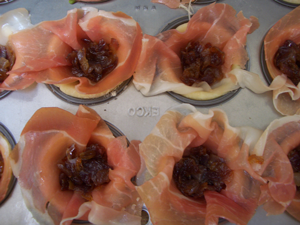 The layer of prosciutto was in part to give the quiche an extra visual flourish but it also creates a nifty handle for pulling them out of the pan, something that normally tends to be a bit awkward. 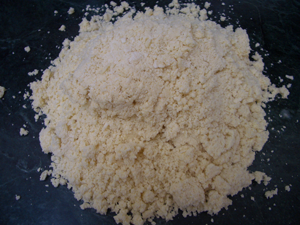 Combine the flour, salt and butter in a food processor. Pulse in short bursts until the butter is the size of small peas and evenly distributed throughout the flour. 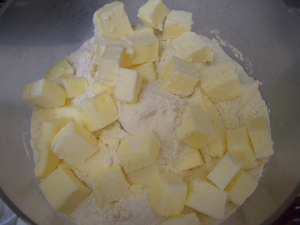 If you don’t have a food processor, use a pastry cutter, fork or your fingers to work the butter into the flour. Add the ice water one tablespoon at a time, pulsing a few seconds in-between. 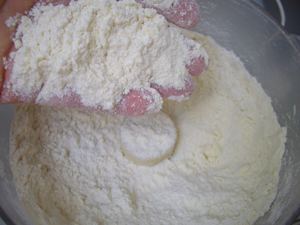 The dough will be ready when it still looks granular but holds together when you press it together between your fingers. 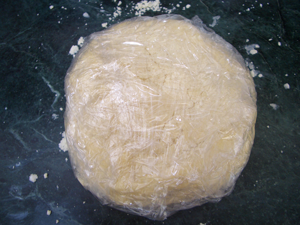 Collect the dough into a ball, wrap in plastic wrap and refrigerate for at least one hour. The dough will keep for several days in the refrigerator or several months in the freezer. 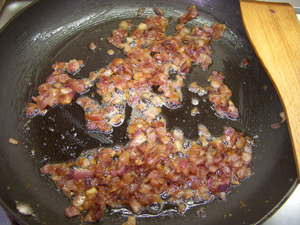 For the filling, melt the half stick of butter over medium heat and cook the chopped onions until they are caramelized. This will take a while, about 30 to 40 minutes. 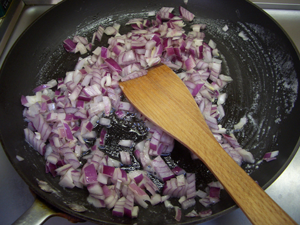 Using a slotted spoon, transfer the onions to a bowl to cool. 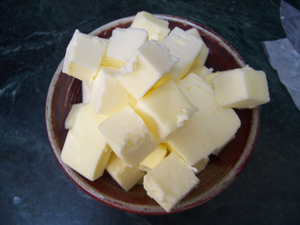 Keep as much of the unused butter in the pan as you can. 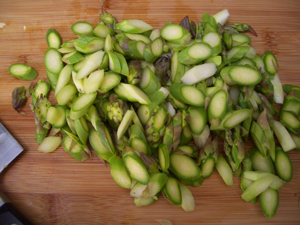 To trim the asparagus, cut off the bottom half inch. 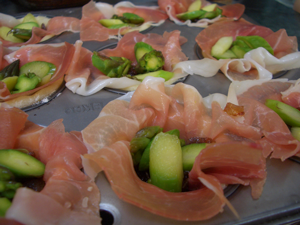 Use a vegetable peeler to whittle the bottom down to the tender bits. Doing this allows you to keep a lot more of the vegetable than the common method of snapping them at the breaking point between the tender and woody parts (thank you Jacques Pepin). 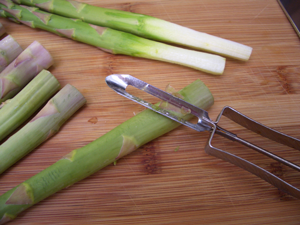 Slice the stalks on the diagonal. Over medium heat, reheat the remaining butter and cook the asparagus for 2 to 3 minutes. You want them to be crisp/tender, not mushy. Set aside to cool. Grate the Gruyère and set aside. To make the custard, whisk the eggs into the half and half. Add a few grinds of pepper and stir to combine. To make the crusts, remove the dough from the refrigerator, and let it sit at room temperature for about 15 minutes. At first it might not look like you have enough for 24 quiche, but the dough should be rolled thin, and if it is you will have plenty. 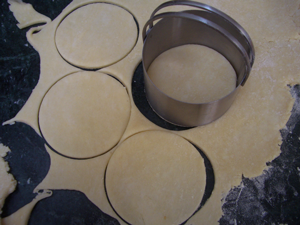 Using a three-inch biscuit cutter, cut as many round of dough as you can. Press the remaining pieces together, roll and cut until you have 24. 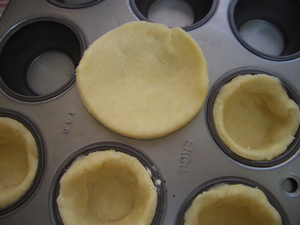 Press the dough rounds into the muffin cups. Don’t forget to press the dough down to the bottom of the cup. 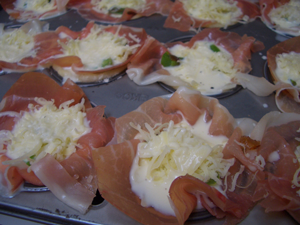 Add a layer of prosciutto to each cup. 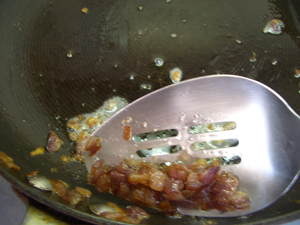 Add a layer of caramelized onion (about 1/4 teaspoon or 1.25ml per). Add a pinch of asparagus to each cup. Add a pinch of cheese. Add the custard. Because the cups are so small and full of ingredients, it’s best to add the custard to the cups using a small spoon, a little at a time. If you pour it in from a measuring cup, it will likely run all over the place. 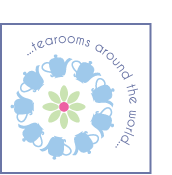 You need to add a little, let it sink to the bottom, add a bit more… Each one will take about 1-1/4 teaspoons or 6.25ml. Don’t worry if the custard runs a bit here or there. Wipe it up as best you can. 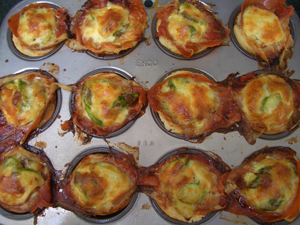 Bake at in preheated oven for 20 minutes or until the quiche are golden and puffy. 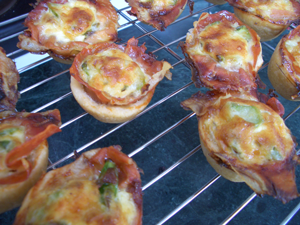 While still hot, remove the quiche from the pan, place them on a wire rack to cool to room temperature, or serve immediately. They’re good either way. Note: The crust dough can be made several days in advance and kept in the refrigerator, or several months in advance and kept in the freezer. 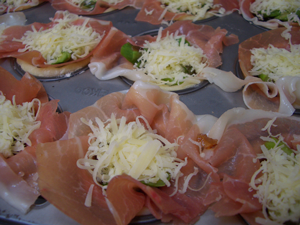 You can also prepare the crusts in the pan and store them in plastic bags until ready to fill. 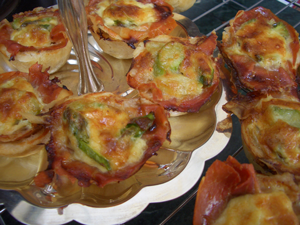 Or to make things really easy, assemble everything in advance and freeze the quiche uncooked. The cooking time for the frozen quiche will be a bit longer. If you remove them from the pan for storage after freezing, it’s a good idea to put them back in the pan to cook, otherwise they will change shape during cooking. They will still be delicious, just a bit flat.